Do you have the need to find an efficient way to down regulate a targeted protein or inhibit gene function while maintaining strong biostability, superior potency and low toxicity for your antisense therapy? Bio-Synthesis's BNA gapmers chimeric antisense RNA oligonucleotide technology gives you the highest knock-down, lowest off-target effect to achieve efficient inhibition of coding and non coding long RNAs (lncRNAs). This new generation of modified nucleotide bases can be inserted in a chimeric antisense oligonucleotide that contains a block of BNA nucleobases which increase the target affinity and protect the internal block from nuclease degradation. Upon binding, BNA modified antisense oligonucleotide activates RNase-H cleavage of targeted RNA. The short RNA/DNA hybrid design (13-16 mers) constructs exhibit remarkable thermodynamic stability and enhanced nucleic acid recognition. 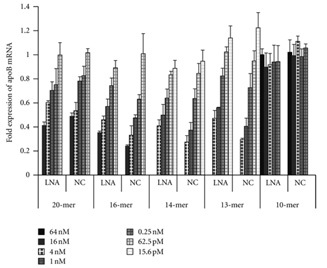 BNA gapmer antisense RNA oligonucleotides offer greater potency and low toxicity than other modified nucleotide. Contact Bio-Synthesis for efficient RNA silencing with BNA gapmers antisense oligonucleotide. Gapmer antisense chimeras are designed to have both 2'OMe RNA and BNA in the sequence that retain an RNase H activating domain of DNA (or phosphorothioated DNA). As BNA bases confer significant nuclease resistance, we suggest the placement of phosphorothioate modification of only at the DNA gap and leaving the BNA flank as phosphodiester linkages in chimeric BNA Gapmer antisense oligonucleotides. The use of 3'-phosphate is preferred when a BNA base is at the 3' end. It can also be beneficial to substitute 5-Methyl-dC for dC monomers in the context of CpG motifs. Substitution of 5-methyl dC for dC will slightly increase the Tm of the antisense oligo. Use of 5-Methyl dC in CpG motifs can also reduce the chance of adverse immune responses in vivo. Bio-Synthesis recommends that all antisense oligos receive RNase free HPLC purification and that oligos undergo a Na+ salt exchange before use in cells or live animals to ensure that salts used in purification are removed. We offer wide variety of base analog modifications, contact us for items not listed below. In-vitro Basic: budget friendly option allowing many designs to go through the initial screening process. In-vitro Standard: RNase free HPLC or PAGE purified oligos suitable for most cell assays. Also available with custom 5’ or 3’ fluorescent labels. In-vivo-Ready Gold: BNA gapmer has been processed by counter-ion (Na+) exchange, desalting, sterile filtration, and endo toxin testing. In-vivo-Ready Platinum: High quality oligos recommended for experiments with the ultimate goal of in vivo testing or cell lines. The BNA gampers have undergo both in vivo processing as well as dual RNase free HPLC purification. Custom Preparative and Analytical Services also available upon request. Bio-Synthesis is the exclusive provider of synthetic BNAs. The purchase of BNA is for research use only. Bio-Synthesis carries a research use only license, clinical/therapeutic and/or commercial application of BNAs require a separate commercial license. We would be glad to discuss licensing terms with interested parties. Artificial regulation of gene expression is an important technique to analyze unknown biological functions of target genes. In antisense technology, a single-stranded oligonucleotide added from outside may bind with target mRNA to form oligonucleotide-RNA duplex. RNase H is the enzyme found in the cytoplasm and nucleus of cells. It hydrolyzes the RNA of the RNA-DNA heteroduplexes formed after sequence specific binding of ASOs to their target mRNA (or lncRNA). Once cleaved by RNase H, the degraded mRNA is not translated into the protein, resulting in down-regulation of the targeted protein. However, serious difficulties, such as poor binding ability of added oligonucleotides with target mRNA or target duplex DNA, and low stability of added oligonucleotides against nuclease degradation often limit practical applications of the antisense or antigene technologies in vivo. Other limiting factors such as the occurrence of toxic side-effects together with non-specific binding causing off-target effects has stimulate the design of new artificial nucleic acids for the development of modified oligonucleotides that provide efficient and specific antisense activity in vivo without exhibiting toxic side-effects. Fewer side effects: Due to not having a passenger strand, BNA Antisense oligos have fewer off-target effects. Strong inhibition of nuclear targets: BNA Antisense oligos are more resistant to endonucleolytic cleavage by nucleases than their counterparts. They are to target RNAs more efficiently, thus making them more stable to studying nuclear RNA function. No transfection agent: BNA Antisense oligos can be taken up by the cell unassisted, without transfection agents. 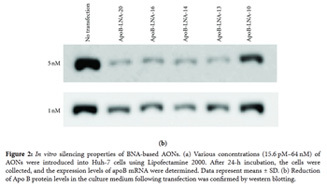 Stronger biostability: BNA has stronger biological stability in human serum against nuclease degradation. BNA antisense oligos also have high potential in cell membrane penetration and successfully interact with the intracellular target site. Lower concentrations: BNA gapmer chimeric antisense offers superior stability and potency than oligos that do not include BNA bases. The high binding affinity allows the use of short oligonucleotide length (10-16 nt) . The excellent pharmacokinetic and pharmacodynamic properties of BNA™ gapmers have been demonstrated using shorter oligo design with stronger binding affinity of BNA chimeric gapmers activity at very low concentration. 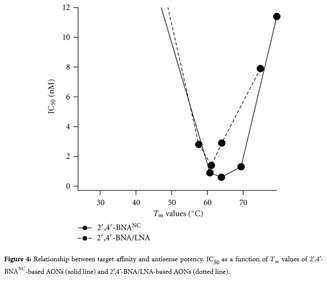 High Potency and lower toxicity: BNA chimeric antisense oligos are well tolerated in cell and exhibited low toxicity in vivo since this gapmers can be used in low concentration compare to other type of modified analogs. Bio-Synthesis will assist with the design of BNA Antisense oligos. The technical staff will review the application and requirements for the project, as well as offer suggestions and recommendations.